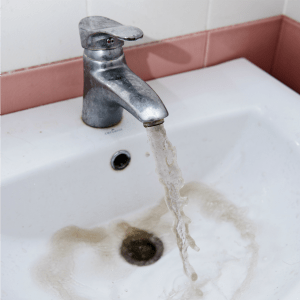 Do you have stubborn rust stains on your porcelain bathtub or sink that you are having trouble getting rid of? 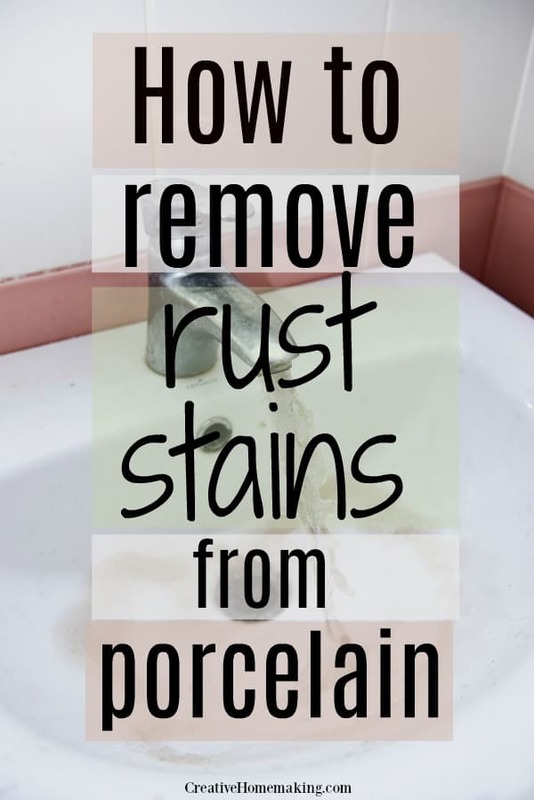 There are several different methods for removing rust from porcelain: some natural, and some chemical based. If you want to use non-toxic cleaners to remove rust, I will give you a couple of solutions you can try. 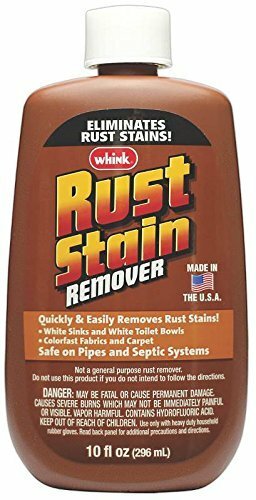 If those don’t work for you there is a commercial product called Whink Rust Stain Remover that you will definitely want to try. It dissolves stubborn rust stains almost instantly. One way to remove rust from porcelain is by using lemon juice and salt. You can either use lemons that are cut in half, or bottled lemon juice. Pour lemon juice on the rust stain and sprinkle salt over the lemon juice. Let the lemon juice and salt sit on the rust stain for several hours and then scrub with a microfiber cloth. Scrub with a bathroom scrub brush if it’s a stubborn stain. Repeat if necessary. *Note: If your porcelain sink or tub has a shiny finish, the acid in the lemon juice could remove some of that shiny finish. Test the lemon juice in an inconspicuous spot first before using on a large area. Favorite tip: Whink Rust Stain Remover easily removes rust stains from porcelain sinks, bathtubs, and toilet bowls with no scrubbing. Baking soda is also a great natural abrasive for cleaning tough bathroom stains. You can use baking soda in the place of salt. Make a paste of lemon juice and baking soda and apply it to the rust stains. Let the baking soda and lemon juice mixture sit on the rust stain for several hours and then wipe away with a microfiber cloth. Repeat if necessary. Using a pumice stone is another natural way to remove rust stains from porcelain. The fine grit of this stone is gently abrasive and helps to reduce scratching. Pumice stones work great to remove rust and hard water stains from bathroom fixtures and porcelain bathtubs. Just scrub gently with the pumice stone and wipe rust stains away. 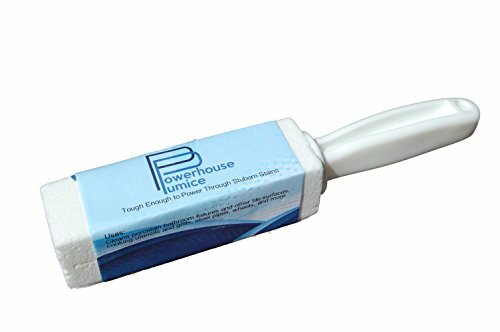 Pumice stones are also great for removing stubborn toilet rings from your toilet! Borax is an all purpose household cleaner that some people have found effective in removing stubborn rust stains. Make a paste of Borax and warm water and apply it to the rust stain. Let sit for about an hour and then wipe with a microfiber cloth. If you don’t have any luck removing the rust with the natural methods described above and you are desperate to get your porcelain looking like new again, you might want to consider using a chemical cleaner. When using this cleaner you want to have the room well ventilated and wear rubber gloves. The great thing about this cleaner, however, is that it works instantly. No need to apply and come back a couple of hours later. Just apply Whink Rust Stain Remover to the rust and scrub with a bathroom scrub brush. Watch the rust instantly disappear. This stuff really works! It received 4/5 stars on Amazon. Read what customers have to say about it. It’s also very inexpensive. Follow my cleaning hacks board on Pinterest.